My student loans are in deferment until next spring. Up until this past week, I hadn’t made any payments since they went into deferment. But I know the interest in accumulating and adding to my already large balance. And it’s time I did something about that. Even if it is just a little something. I asked the BAD Community for guidance on what debt I should be targeting over the next couple of months last week in my September Debt Update. I’ve never really paid attention to the Group A and Group B and I’m not sure how that affects anything since they both have the same interest rate. With a target on a different debt, I have some questions about my student loan plan of action. Knowing that no payments are due until next spring AND that it is accruing some interest. Should I add a small regular payment toward my student loan debt to my monthly budget? If yes, should I target a specific Group? And how does that matter? If yes, how much should I add to my monthly budget? I’m guessing it should be enough to cover interest and prevent an increase in the on-going balance. I paid $100 toward Group B last week. Another one of my flying by the seat of my pants decisions. But I feel like I need a solid plan with this. And I need your advice. You should pay off your credit card that has a balance and 17 percent interest. So when your loans come out of deferment (with a unknown now minimum) you are in the best position possible to pay them. I agree with the others, pay off the credit card while these are in deferment. 17% is a killer interest rate. When I got out of debt, I started with the smallest balance first. Have some Victory matters and helped me keep the momentum. After I paid my first, I debt snowballed. I know others are worried about the interest, and that might have worked for them. But I needed some gratification. No – do not start paying a little bit each month to your student loans. Laser focus on paying off your collections, then your credit card, then your car! Once those are gone, all your debt money will go towards your student loans. 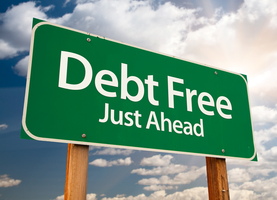 The debt snowball is the best method (in my opinion) to get rid of your debt and stay motivated! It really does work! I think I recommended a while back that you think more about your student loans, but I’m going to change my advice based on the deferment ending next spring. That’s not so long from now. Instead of sending a little money to them every month, I’d agree that you should really focus on getting rid of the credit card balance and collections debt. You can probably get rid of most if not all of that prior to the loans coming out of deferral. That will leave you just them to focus on. I didn’t mention the car because I don’t think it’s worth focusing on that particularly. I’d just keep doing what you’re doing with the car. So to summarize: for now, pay car loan minimum plus pay credit card and collections aggressively. Next spring, pay car loan minimum and start paying student loans aggressively. When they come out of deferment, don’t do something to get them back in that program. Make the payments. Remember that student loans are not able to be discharged by bankruptcy. These will follow you to your grave if you don’t get them paid off. The interest rate isn’t significant enough to raise a ton of concern. If I were in your shoes, I would prioritize as 1. Credit card; 2. Tax Debt, 3. Apartment Collections, 4. Car, 5. Student loans. PAY OF YOUR CREDIT CARD. stick to one plan. that’s hurting your focus because you haven’t done any one thing consistently (and debt is like diet – doesnt matter which one you do, just have to do it for long enough). Like someone said up there. if you pay it off before deferment ends, then you can take all that money you were paying on your CC and send it to your loan. Imagine how NICE it will feel to not have CC debt. Your interest rate on these loans is so low! I wouldn’t pay a cent extra on these until you’ve taken care of your other debts. Remember, the two main streams of thought in terms of debt payoff are lowest balance and highest interest. Either way, these loans should be your lowest priority in terms of extra payments.